One of the most apparent features of the PX-4 was the cartridge bay. 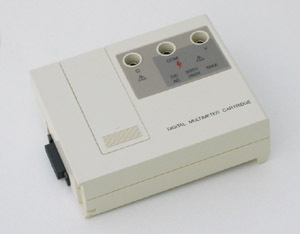 Apart from developing several cartridges themselves, Epson also provided full documentation on the cartridge interface, so third parties could make cartridges too. Below is an overview of the cartridges developed by Epson. 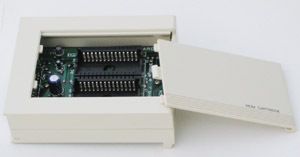 H403A The ROM cartridge is fully supported by the PX-4 OS and maps the ROMs default as J: and K:. The ROM types supported are the same as for the internal ROM drives (B: and C:), 8kByte, 16kByte and 32kByte. RAM The RAM cartridge is fully supported by the PX-4 OS and maps the RAM as disk I:. The standard Epson RAM cartridge contains only 16 kByte, but 32 kByte and 64 kByte are supported too. 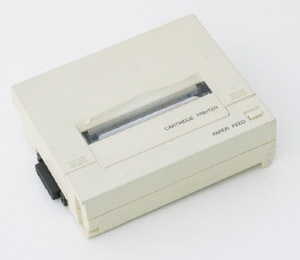 The third party cartridge shown here contains 128 kByte. Without driver, it reports 32 kByte in size. Epson UK were unhappy that the literature said a 64K was available but Epson NEVER made one bigger than 32K so asked me to manufacturer 64K units - I decided to also make and sell 128, and 512 units packed in the same cartridge. At the time only a few governments and airlines could afford that "world's biggest" state of the art memory pack and I hand to have an export licence from the UK government as it was considered "of military importance" - The United States invasion of Grenada 1983 had used a laptop with less memory on the invasion beach. Epson had to use the mass production system and the time to get a larger cartridge would have taken a year or 2 to get ready - I made the larger cartridges using the latest components and in smaller quantities for governments and other organizations that needed the extra memory immediately. I also transferred to the Px-16 when it was available. A batch of about 50 PX4 portables was sold to the Nederland Central Bureau of Statistics each with a ram pack designed and manufactured by me. The original idea was for the gathering of employment statistics by taking a laptop to peoples door. The larger memory capacity was considered necessary at the time but not available from the laptop manufacturers. A special 128 kByte cartridge was designed as a sealed unit and has a U.S. military grade lithium battery developed from a heart pacemaker battery with a theoretical life (based on the drain on the battery) of over 50 years. Some buyers were uncomfortable with the idea of not changing a battery although today we are quite happy with a micro XD card. The data bus was multiplexed using 4 unused lines to expand the capacity by a maximum of 32 times in the largest we made. 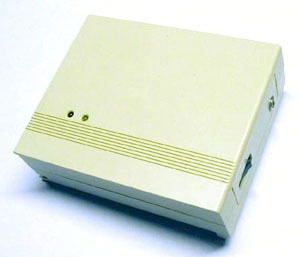 As the cartridge was only used for dedicated applications the driver software was supplied to the end user and incorporated into the application software. 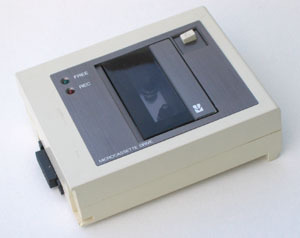 H404A The microcassette drive is fully supported by the PX-4 OS and maps to drive H:. H409A The Cartridge Printer is fully supported by the PX-4 OS. The width is 60 dots or 40 characters. A character is printed as 6 x 8 dots. 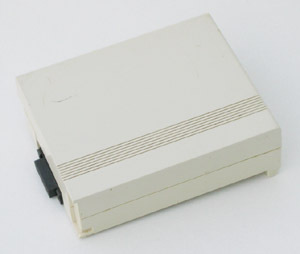 The ribbon cartridge is ERC-09 B.
Modem The modem cartridge is not supported by the PX-4 OS, so needs special software to function. It can dial and auto anwser and communicate up to 300 bps (Bell 103). The internal PX-4 RS-232 port is used for data transfer. In the Operating System Reference Manual is a Modem Sample Program that demonstrates the cartridge. As I have no modem cartridge, I cannot test this. The DMM is powered by its own two AAA-type batteries. 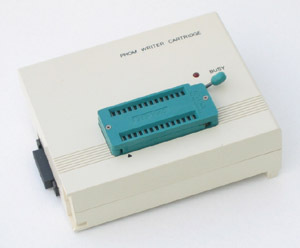 H413A The PROM Writer cartridge is not supported by the PX-4 OS, but needs special software. An example is the ROMWRITE capsule ROM. A description of the software is available. The PROM Writer supports 2764, 27128 and 27256 type EPROMs. Another package in ROM is PROM WRITE 2, which is an integrated image creator and programmer.